Discussion in 'Canon InkJet Printers' started by Dre, Feb 10, 2019. Hello everyone, im new to this site and have been reading quite a bit of forums on the Pro 100. I hope that being part of this community i can ask some great questions and share my knowledge and experiences as well. My current firmware on my Canon Pro 100 came installed already with firmware 2.001. As i did a nozzle check i discovered this. Does anyone know if this update has any holdbacks or patches for us refillers. I'm worried that im already heavily invested and order PC colours inks and it wont work or have difficulties. Any info on this 2.001 version of the canon pro 100 and its features and updates it did. I tried to search on the web but no details whatsoever. Hi @Dre and welcome, let’s get something straight first, did you upgrade the firmware or did the machine come with that Version already installed...? 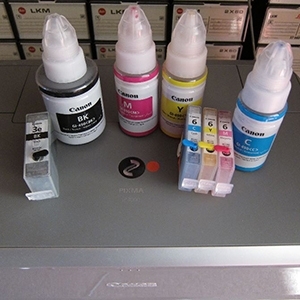 The good news is it won’t stop you from using 3rd party inks in any way just so long as you use OEM cartridges, compatibles might have a problem, but we don’t know yet. avolanche, stratman and Dre like this. Thank you @The Hat for your speedy reply. Wasn't expecting such a fast response tbh lol. The printer already came installed with that version of firmware which is why i worried a bit. Im super happy to hear that im still able to refill with OEM carts. This is the path i was taking. And i couldnt agree more on NOT DOING the firmware updates on these printers. Its honestly a blessing to be able to refill and have such great results with 3rd party inks. Its honestly a blessing to be able to refill and have such great results with 3rd party inks. You might not think that when your prints start to look prematurely aged, but that will all depends on the quality of paper you use, OEM inks are by far the Superior and the most expensive.. Yes, im aware that longevity will be a downfall with third party inks. At the end of the day this is just a hobby and i dont have any intent to sell or expect 100% OEM results. Im simply just enjoying the printing journey and being able to bring my photos to life kinda thing. I'll be using Canon papers for most of the time like Pro Luster and Canon PP-301 Photo Paper Plus, Glossy II until I get comfortable to try new papers. I'll be storing my photos in albums if anything.....so hopefully that helps a bit on the longevity side of things. And if they fade.....so be it you know, i can always print again for cheap. Welcome to the forum, Dre. May you have many years of happy printing with your Pro 100. Did you ask Jose his thoughts on your firmware version? If so, what did he say? @stratman im waiting on his reply. I asked him the question on his youtube channel.....still waiting. I guess i should of asked here instead of youtube lol. Unfortunately i only made this account this morning after i asked him on youtube. Also thank you for the warm welcome @stratman. Im getting good vibes being here and happy everyone is friendly here, even though im a complete newbie. YW. The forum does have good vibes. Let us know what the TMan replies. Absolutely, Ill keep you posted. @stratman, JToolman has replied regarding this topic. My current firmware on my Canon Pro 100 came installed already with firmware 2.001. As i did a nozzle check i discovered this. Do you know if this update has any hold backs or patches for us refillers. I'm worried that im already heavily invested and order PC inks and it wont work or have difficulties. Any info on this 2.001 version of the Canon Pro 100 and its features and updates it did. I tried to search on the web but no details whatsoever. "I have heard ofna single report concerning the PRO100 and any FW yet"
To my understanding of his reply, i think he was say that he hasn't heard of a single report concerning the Pro 100 with any Firmware update. Correct me if i understood hes reply wrong.